Joni Adamson is Professor of Environmental Humanities in the Department of English and Senior Sustainability Scholar at the Julie Ann Wrigley Global Institute of Sustainability at Arizona State University where she directs the Environmental Humanities Initiative (EHI). She is the author and/or co-editor of American Indian Literature, Environmental Justice and Ecocriticism (University of Arizona Press, 2001), The Environmental Justice Reader: Poetics, Politics, and Pedagogy (University of Arizona Press, 2002), American Studies, Ecocriticism, and Ecology: Thinking and Acting in the Local and Global Commons (Routledge, 2013), Keywords for Environmental Studies (New York University Press, 2016), Ecocriticism and Indigenous Studies—Conversations from Earth to Cosmos (Routledge 2017), and Humanities for the Environment (Routledge 2017). She lectures internationally and has published over 70 articles, chapters and reviews. She is a Director of the North American Observatory of the Humanities for the Environment global network and editor of the Cambridge University Press book series New Directions in Sustainability and Society. Adamson, Joni, and Michael Davis, eds. 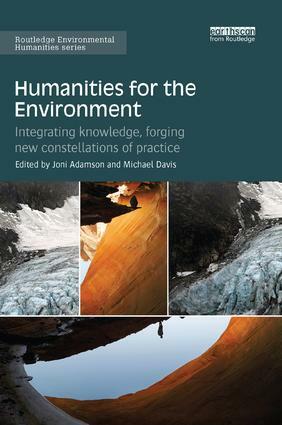 Humanities for the Environment: Integrating Knowledge, Forging New Constellations of Practice. London: Routledge, 2018. Monani, Salma, and Joni Adamson, eds. Ecocriticism and Indigenous Studies: Conversations from Earth to Cosmos. London: Routledge, 2016. Adamson, Joni, William A. Gleason, and David N. Pellow, eds. Keywords for Environmental Studies. New York: New York University Press, 2016. Adamson, Joni, Mei Mei Evans, and Rachel Stein, eds. The Environmental Justice Reader: Politics, Poetics, and Pedagogy. Tucson: Arizona State University Press, 2002. Adamson, Joni. American Indian Literature, Environmental Justice, and Ecocriticism: The Middle Place. Tucson: University of Arizona Press, 2001.